I was at da park just watching da lil kids play wit their parents. I didn't want 2 go back there, cause I know me n Ebony is gonna get into a fight n it would never end. As I was just sitting n watching I heard my phone ring wit a text, I opened my phone n ready da text, it was 4rom Kelly. New Message- Where r u? I didn't know if I should text or not, but sumthing was telling me 2, so I did it anyways. I couldn't stop him, so I just let it be. I went back 2 watching da lil kids play. I have 2 say even through I'm young I can't wait 2 be a mother. So I notice dat sumbody was standing next 2 me, I looked up n it Kelly, he sat next 2 me. I didn't know wat 2 say 2 him, maybe I told u so. But I don't want him 2 feel bad or anything, but before I could say anything he said sumthing first. He helped me up n we started 2 walk back 2 him house, their was no way 2 talking 2 Ebony. Were both da same stubborn, so wats da point. So we continue 2 walked back 2 their house. Once we got 2 da doorsteps I was scared but I knew watever happen, happens. So Kelly unlocked da door n he walked in first n den I walked in. I seen Ebony n Carnell r cuddle up n she wants 2 come at me wrong, yea right. Me, Ebony n Megan gave each a hug. I could tell da boys wanted 2 c a fight but dat wasn't going 2 happen. But I have 2 admit dat deep down inside I'm feeling Kelly. After dat we chill, but it wasn't like I could be wit anybody cause me n Nell r over. Megan n Patrick was all on each other on da couch watching da movie, Ebony n Kelly were cuddle up on da loveseat watching da movie, while me n Nell were floor but not even next 2 each other. I felt out of place. I got up 4rom da floor n went into da kitchen n sat at da table, I guess Megan noticed n came in. I got up 4rom da table n gave Megan a hug, I went upstairs n laid down in Patrick's room since me n Patrick r like brothers n sisters. I notice dat Steph left da room, n Megan got up n went into da kitchen wit her. But den Megan came back n Steph wasn't wit her. I moved Ebony's head n told her I'll be right back n went upstairs, acting like I was going 2 bathroom. I notice Patrick's door was close, so I knocked on it but their was no answer. So I opened da door n seen Steph sleeping like a baby, I have 2 say she looks so cute sleeping. I closed da door n wat back downstairs n sat next 2 Ebony again. I'm glad me n Steph got over r differences but I feel like dat ain't da last of it. C deep down inside of me I like Carnell, but I can't tell nobody cause I don't want it 2 get out n den other people find out. So I just stayed wit Kelly, but I think dat he has feeling 4 Stephanie. Wateva is going on will come out soon n sumbody would get hurt. I wish I knew wat Stephanie is going through but I dont', but I told her 2 go upstairs so dat she wouldn't have 2 deal wit all dis. I notice dat wen I came back dat Kelly got up n went upstairs, I think he likes Steph but won't say nutting cause he still go Ebony. N I know dat Ebony n Carnell likes each other, cause wen Kelly left 2 find Steph they started talking n it seem like they were getting alone. I just hope watever is going on will come on, cause I don't want 2 be in da middle of everything. I fell asleep on Patrick's bed, but I wasn't sleeping 4 dat long. Wen I woke up I looked over at his clock n it said 1 in da morning, but they blasting music dats y I woke up. So I went into da bathroom n washed my face n went downstairs. I went over 2 da couch n sat down while they were doing their own thing. I wasn't really in da mood 2 dance or anything or I got up n went into da back. Every time I'm done I like 2 go outside n look up at da stars, I guess sumbody came outside cause they said sumthing. 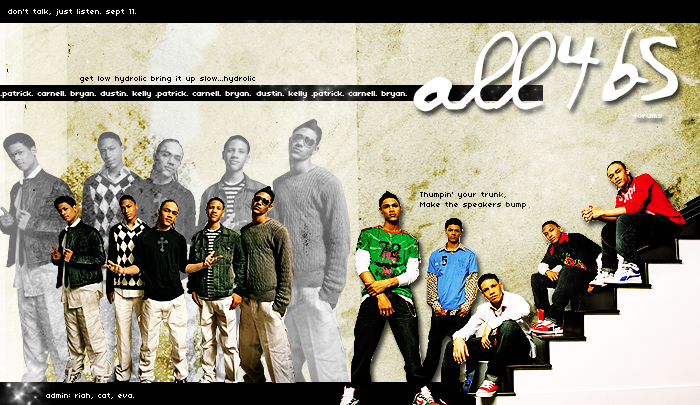 Carnell- U still do dis? Carnell- So wat r u going 2 do now? He continue 2 go upstairs n I laid down on da couch, I started 2 close my eyes n behind I knew I was knocked out again. I just hope dat everything would be alright after 2day. I really couldn't sleep cause it start 2 storm outside n lets just say I'm scared of dat due 2 fact wen I was young. So I sat up on da couch n rocking back n forth, I guess sumbody was up cause I heard dem walking around n bout 2 come downstairs. Wen they got downstairs they notice me n came over 2 da couch n wen I looked at da person it Kelly, at first I thought it Carnell cause he knows how I am wen it's storming outside. I was shaking my head no, cause I wasn't gonna sit here n lie n tell him dat I'm alright. He got up 4rom da couch n went back upstairs, I knew I couldn't stay down here by myself so I decided 2 go upstairs n stay in da room wit Carnell since their was no where else 4 me 2 stay. So once I got 2 his door, I knocked just incase, but 2 my surprise he was up, so I opened da door n went inside. He moved over n I got in da bed wit him, at first we wasn't saying nutting 2 else, but since da both of us couldn't sleep we figured we have 2 say sumthing 2 each other. Carnell- Can I ask u a question? Carnell- Y did u break up wit me? I guess he was happy cause he lift my chin up n gave me a kiss, n I have 2 say I was happy 2. So I laid my head on his chest n he wrapped his arms around me n we fell asleep like dat. Wen I woke up in da morning I notice dat Carnell was still sleeping, I 4got how cute he looks wen he's sleeping. So I thought I had 2 mess wit him, so I started 2 tickle him it was funny cause he was trying 2 make me stop but his eyes were still close, so I kept on doing it. But den wen I did it again he opened his eyes n looked down at me, I act like I didn't do nutting. Carnell- Y r u tickling me? He just moved himself 4rom under me n made me hit my head on da bed hard, I'm gonna get him back. I seen him walk out of his room, probably went down 2 da bathroom. I just laid on his bed n turned on tv, since I didn't feel like going downstairs yet. As I was laying there watching tv Carnell came back into da room n got back into da bed n started 2 watch tv wit me. I just watching Spongebob since it was Saturday n dats my favorite show. Carnell- U know dis is my room right? After me n Carnell got done wit dat I went back 2 watching tv, I don't like how he made me miss sum of it. But anyways as I was watching it I heard dat Patrick n Megan was up cause they were talking in da hallway n u could hear dem. So me n Carnell went 2 go c wat they were talking. But I guess they were shock 2 c me coming out of Carnell's room. Carnell- Anyways enough bout us, is Kelly n Ebony up? So me, Megan, Carnell n Patrick went downstairs, Patrick n Megan were sitting on da couch n me n Carnell were sitting on da loveseat. Since Carnell made me miss da spongebob I had 2 make sure I watched da second one. So I turned on da tv n turned it 2 spongebob, I notice dat they all were looking at me. But oh well, I always watch spongebob on Saturday morning. As I was watching dat Kelly n Ebony came downstairs n sat on da couch wit Patrick n Megan since their was room there. They looked at me n throw a pillow at me, they lucky I didn't feel like beating nobody. After it was happy they came over 2 me n started 2 get me, but I didn't care cause I knew I was happy. Since nobody really wanted 2 go out we decided 2 stay at da boys house all day, plus it was Saturday. Me, Ebony n Megan were in da kitchen talking while da boys were in da living room playing on da Xbox 360. Ebony- I can't believe u n Carnell got back 2gether? We got up 4rom da table n went into da living room wit da boys, Ebony decided dat she'll stand in front of da tv, while Megan started 2 play wit Patrick's hair, n I started sweet talking 2 Carnell. It was going well, but they started 2 make us stop, so Ebony moved out da way n went over 2 Kelly n sat on his lap. After a while they could tell we wanted 2 get on their nervous dat they stopped da game, at first it looked like nutting, but it looked like they wanted 2 chase us. So we got up n started running, we ran outside n Megan got da holes we hide behind da house n wen they came out we were going 2 wet dem. It didn't take dem dat long 2 come out, so wen they did Megan started 2 wet dem, it was so funny. We came 4rom behind da house n seen dat they were soaked it was funny, but den as we were standing there, we noticed dat Kelly got da holes n he started 2 wet us. Kelly- Look wat u done 2 me? Me, Ebony n Megan went inside n got towels 4 us, since we were wet. We decided dat we'll stay upstairs, while da boys were downstairs finishing their game. I'm changing around Ebony, but it's still gonna be da same idea u gave me. So da boys were downstairs still playing their game, but after da game was over they decided 2 come upstairs wit us. We were just sitting in Patrick's room watching tv since we know how Kelly n Carnell r bout their rooms. So we was just sitting there n da door opened n in walked da boys but they were holding things behind their backs, so we were looking at dem. Ebony- Wat do y'all got? We got up 4rom where we were sitting n turned 2 get wateva was behind their backs, but it was 2 late cause they started 2 get us. Kelly had Chocolate syrup n was getting Ebony. Patrick had whipped cream n was getting Megan. N Carnell had strawberry syrup n was getting me. After dat we ran out of da room n downstairs, but they just came after but we knew we were not going 2 help dem clean up. We were just chilling in da living room after we got clean up, but da boys had 2 clean up they mess. But since they were taking 4ever 2 do it we decided just 2 help dem, cause if not they would be cleaning 4 da rest of da day. Wen we helped dem it only took bout an hour n den we went back down 2 da living room n chilled in there. But I knew I had 2 get home, cause I knew my mom n dad had 2 work 2night, even through it's Saturday n Tyga is probably going sumwhere. I went upstairs 2 Carnell 2 get my stuff 2gether n came up while I was doing dat. Carnell- U need a ride? Once I got my stuff 2gether we went back downstairs, I said bye 2 everybody n left out da house wit Carnell. I got into his car n he drove him, I didn't live dat far 4rom him. I gave him a hug before I got out n got my stuff n went up 2 my house. I unlocked da door n went inside, I notice dat nobody was home. I put my stuff up in my room n went back downstairs 2 watch tv. It was bout two hours later since I been home n I admit I was getting bored, since there was nutting 2 do here. I was going 2 call my older cousin 2 c if she wanted 2 come over, but she's probably wit her boyfriend who gets on my nervous. But I called her anyways. Monica- Hey Steph, wat u doing? Kelly- I know, but look ur going 2 Ty's party on Friday? I hanged up n decided 2 watch a movie since their was nutting better 2 do. But as I was watching da movie it put me 2 sleep. As I was sleeping I was having dis crazy dream dat I couldn't explain. I woke up in a cold sweat, I couldn't believe wat I was dreaming of. I got up 4rom my bed n looked over at my phone n it was only 3 o'clock in da morning, but I really needed 2 talk 2 him, so I picked up my phone n looked 4 his number, once I found it I pressed da call button. I waited 4 him 2 answer, n finally on da fourth ring he picked up. Kelly- 4 real? Now wat happen? Kelly- Alright, so wats wrong wit dat? I hanged up n turned 2 my side n tried 2 go back 2 sleep, but I just couldn't sumthing bout dat dream was really telling me sumthing n I don't know wat. 4rom all thinking I think it put me 2 sleep cause next thing I knew I was sleeping. By time I got back up again it was already 10 in da morning, so I got up 4rom my bed n went into da bathroom n washed my face n went downstairs n seen my parents sitting there. Wonder where Tyga is. I got sum food n sat at da table wit my parents, I really hope dat wateva happens 2day is gud, cause I really don't want 2 go through no drama 2day. After I was done eating I went upstairs 2 c wat I could wear, I decided 2 wear sum skinny jeans wit a top 2 match n sum forces dat wat wit it. I got into da shower n did my thang n den did my hair n lotion up n put on my clothes, by time I was done my phone started 2 ring. I hanged up n just finished getting ready, once I was done I hanged a horn beep, so I looked out of my window n seen Kelly's car. I told my mom n dad dat I'll be back later n left out of da house. I walked over 2 his car n got in n den he drove off. He drove 2 dis place where nobody could c us, n I was glad. Kelly- So wats going on? Kelly- Wat was it bout? Kelly- U know wat was going? We continue talking bout wat were going 2 do. After dat he drove me home, I got out of da car n went inside. I was trying 2 call Kelly all day but he's phone was off n he never turns his phone off. So I decided 2 go over 2 his, but wen I got there I didn't c his car. But I just rang da bell anyways maybe Patrick took his car. Wen I rang da bell Patrick came 2 da door. Ebony- Wat up Patrick, is Kelly home? He let me in da house n I went over 2 da couch n sat down, he told me dat he was leaving 2 go over 2 Megan's house so I turned on da tv n started 2 watch tv. As I was watching I seen Carnell came down without a shirt on n sumthing came over, I 4got wat I was here 4. Carnell- Ur here 4 Kelly? He went into da kitchen n I had 2 let out my smile, Steph was lucky dating him. But dats my best friend I can't do dat 2 her. He came back out 4rom da kitchen n went upstairs n den da door opened n Kelly came in. Kelly- Y r u question me? I just left out of da house n decided 2 go n talk 2 Steph bout wat just happen, cause I know dat Megan is busy wit Patrick. Wen I got 2 Steph's house I rang da bell n she came 2 da door n answer it. We just sat there n talked bout r relationships n how they r going, but I can tell dat da both of r's r not going 2 last 4 sum reason even through I like Kelly.